XR-5 able to withstand hydrocarbon contaminant, making XR Geomembranes the right choice for Shell Oil. For long-term containment of hydrocarbon contaminated liquids, Shell Oil relies on XR-5 geomembrane manufactured by Seaman Corporation. Designed for exposed applications, the XR-5 offers minimal thermal expansion/contraction, no environmental stress cracking, lower CQC/CQA costs, and a higher strength than other lining materials. 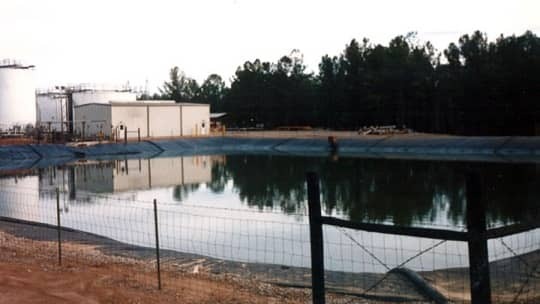 In 1988, several impoundments at Shell Oil's carbon dioxide production facility in southern Mississippi were lined with 30-mil reinforced XR-5 geomembrane. These impoundments contain overflows and spills consisting of oil and salt water, chemicals which can break down the strength of any lining that is not chemically resistant to a wide range of hydrocarbons. But XR-5's resistance to chemicals is evident since the geomembrane has a long history with hydrocarbon containment and has been lab tested for over ten years in constant contact with crude oil. Plus, field seams and CQA are minimal since the flexible XR-5 was factory-manufactured into panels approximately 15,000 square feet each.